Bundles of grapevine twigs handtied into unique looking swags. Available in many sizes. Tell me the colors you would like in the box on the order form. Would you like a solid color or a printed ribbon bow? I'll e-mail you a picture of the finished swag before I ship it to you. Questions???? Please e-mail them to me. A 12" vertical twig swag with sunflower ribbon and a large sunflower fastened into the center of the bow. 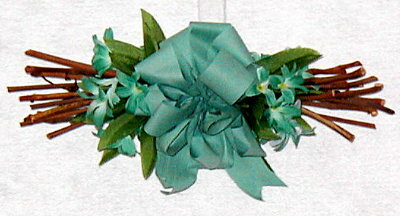 Seafoam Green are the colors used on this 12" twig swag. This 14" twig swag is ready for the winter holidays. 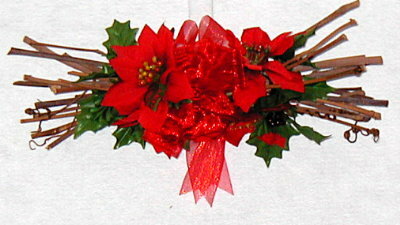 It has a sheer red ribbon bow with red poinsettias and holly leaves on each side. Is purple your color? This 16" twig swag features a printed purple ribbon with small purple flowers scattered on the branches.